Today, the Chabad House celebrates its 37th Anniversary. This milestone celebrates achievement and growth, but at the same time it lauds a unique ability to retain personal connections with all who walk through its doors on College Avenue. Thirty-seven years ago, the new Chabad House’s mandate was to reach out to countless unaffiliated and even estranged young men and women, and bring them back into the folds of their Jewish heritage. Although that need remains critical, today the Chabad House also embraces increasing numbers of students whose commitment to Torah, halacha, chesed, and advanced learning governs their daily lives. Chabad’s mission has expanded to provide appropriate outlets to help these students not only retain but grow in their commitment to Judaism. That so many of these students choose to attend Rutgers is a direct testament to the Chabad House’s stellar reputation for caring staff, dynamic programming, an environment imbued with Yiddishkeit, beautiful dormitory suites, and exceptional amenities. Join us as we reflect upon 37 years of trials, tribulations, laughter, learning, Shabbat meals, deep exploration, sharing, caring, and love. “When we arrived at Rutgers in 1978, there was no Jewish presence on the College Avenue Campus,” Rebbetzin Rivka Carlebach recalls. Although the Carlebachs had no concept of what the future would hold, the newlyweds knew they needed to be centrally located. With confidence that they were doing Hashem’s work and with the Rebbe’s blessing, they forged ahead. The Carlebachs rented Room 448 of the Rutgers Students’ Center, stored a Torah scroll in an old chemistry lab cabinet, and invited students to join them. And so they did! Students showed up. At first they came to Friday night dinners, then to services, then to Purim Parties, and finally to compelling classes and social events. This miracle went hand-in-hand with the generosity and commitment of a core group of dedicated supporters who understood that Chabad represented the future of our Jewish youth. These visionary individuals included Jeffrey and Lita Greenberg, Dr. Moshe z”l and Dr. Mini Verter, Harvey Flug, Murray Feldman, Dr. Elliot Rudnitzky, Sandra Berman, Harry Franco, Dr. Michael Nissenblatt, Danny Kahane, Dr. Gerald Weisfogel, Jeffries Shein, Norman Tanzman, Pauline Sadowitz, Isadore Goldberg, Leon Smith, Alvin Rockoff, Ira Chase, Harvey Hoff, and Harold Bruskin. In 1981, an old firehouse became available for rent with an option to buy. Rabbi Carlebach seized the opportunity to rent the 2,200 square foot building at 8 Sicard Street. The larger new building helped ensure increased attendance at regular religious services, including Friday Shabbat Experience, Rosh Hashanah and Yom Kippur prayers, Chanukah Candle Lighting, and Passover Seders. Other dynamic activities included Shabbatonim, Build-Your-Own-Sukkah workshops, dancing in the street on Simchat Torah, Chanukah Chesed, and Israel Advocacy. Yet, when more than 200 students signed up for kosher meals, it became clear that this new home was way too small. The Goodmans established a student leadership council that is formed annually and includes approximately 35 students from diverse backgrounds, affiliations, and degrees of observance. This inclusive philosophy is epitomized in one of Rabbi Goodman’s favorite sayings of the Rebbe, “Labels are for clothes, not for people. Here at Chabad, we are all one.” The Goodmans increased and enhanced the Chabad House’s dynamic programming. In the late 80’s, the Goodmans saw a need to begin a kosher lunch plan to provide food for their many volunteers and student leaders. 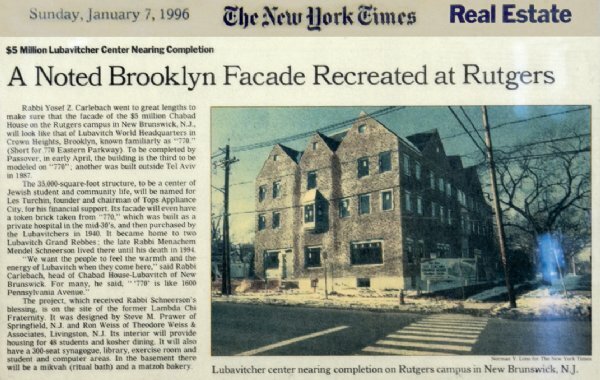 In addition to teaching a multitude of classes, and hosting events such as a “Hoagies ‘n Jewish Heroes” farbrengen, they launched the L’Chaim Newsletter, Rutgers’ only Jewish publication, Rabbi Goodman jams on his guitar with the Chabad Band, “Nice Jewish Boys,” at the weekly Tuesday Night Campus Café. His wife Sarah talks about meaningful spiritual issues with the Jewish women at Rutgers as they knead, braid, and bake challah each Thursday night for their Shabbat Experience weekends. Rabbi and Rebbetzin Goodman are often up in the wee hours of the morning speaking with students who are questioning, exploring, searching, or even feeling totally lost. Students treasure the close life-long connections they form with the Goodmans. In fact, many alumni report that their second and third favorite guests at their weddings were Rabbi and Rebbetzin Goodman! In 1996, when Chabad House opened its magnificent 35,000 square foot replica of the Rebbe’s Synagogue at 770 Eastern Parkway, Rabbi Carlebach knew that the sky was the limit. The Chabad House flourished. Twenty-eight girls now lived in the dorm, hundreds joined the Kosher meal plan, and even more attended Chabad’s daily events. The new location meant that at some point during the school year, every single Rutgers student passed the building. And most of those students walked through the doors, if not to stay, then at least to look around. History repeats itself, and the resounding success of the Chabad House generated a need, once again, for more space. In 2010, Chabad struck a complex real estate agreement with the university, which resulted in its obtaining additional, contiguous space on College Avenue. Chabad embarked upon an ambitious expansion program that concluded in 2012. The expanded Chabad House, now 90,000 square feet, is more than double its original size. The additional facilities enable more students to take advantage of a plethora of wonderful cultural, recreational, and spiritual programs. 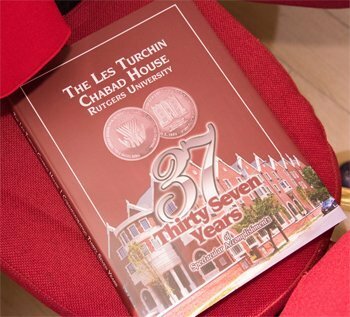 The Chabad House at Rutgers, the largest Jewish Center on any public university campus in the world, facilitates wholesome fun, study, friendships, and emotional and spiritual growth guided by dedicated, sensitive staff, and rabbis. There is no doubt that Chabad will continue to enhance its programing though implementing new, dynamic ideas. The means may change throughout the years, but the end remains the same: welcoming and inspiring Jewish students to explore and embrace their heritage. With Hashem’s help, its leadership’s dedication, hard work, and creativity, and its donors’ generosity …may the Rutgers Chabad House go from strength to strength!